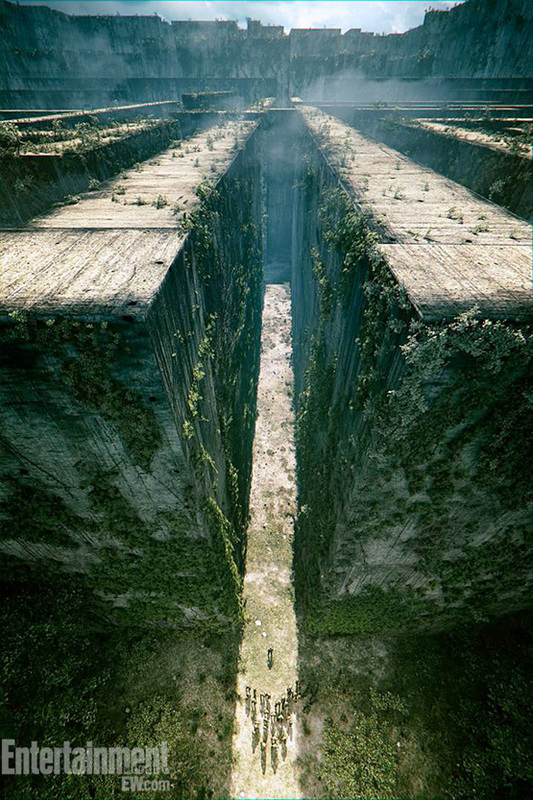 Along with Divergent starring Shailene Woodley, and The Mortal Instruments starring Lily Collins, another young adult novel adaptation attempting to follow in the footsteps of The Hunger Games is The Maze Runner. Based on James Dashner's 2009 book of the same name, the story follows a young man named Thomas who wakes up in an industrual elevator not knowing anything but his own name. He's with a large community of boys trapped in the center of a maze in a mysterious place called The Glade, and the only way out is to navigate the huge maze which changes nightly and is full of creatures called Grievers. More below! What really makes this story interesting is the parameters by which the maze can be navigated. The giant doors leading into the maze open up in the morning, and close when it gets dark. And you better be sure to make it back before then, because no one survives a night inside the maze. Over time, the boys learn that they can't map the maze each day because the walls shift overnight, despite the obviously massive scale of the maze itself. But our hero, played by The First Time and "Teen Wolf" TV series star Dylan O'Brien, "is the boy who takes that step forward when everybody else takes a step back," says director Wes Ball. The film from 20th Century Fox is described as an amalgamation of The Hunger Games, Lord of the Flies and the TV series "Lost." Those are some pretty bright stars to shoot for, but the story does sound intriguing. There's a lot of mystery as to how these boys got there, and what happens when they get out. Plus, most of them don't even remember who they are. This has the potential to be a cool, sci-fi story for youths and adults alike, and it will likely play pretty well with the crowd that is responding to The Hunger Games so well. Stay tuned for more information as it becomes available. Sounds bizarre, like Cube, but for kids. Will give it a check out though. Liking the concept art. With all these things I would try to climb to the top, but maybe that will be dealt with in the story. One of the main characters tried that and... failed. not the biggest fan of teen novels is that's what this is based off of. wasn't a big fan of the hunger games. after looking up concept art of what the grievers look like, I think I'll pass hahaha. idea sounds entertaining, but I'll stick with something more R-rated like Cube. There's no concept art of what grievers look like...Just fan art which doesn't do justice to the description. They're huge slug/insect creatures with metal weapons sticking out of them that are used to shred anything that gets close to it. That's definitely a PG creature, right? fan art I mean, thank you! Cool. I love a good labyrinth film. I was a big fan of this book, so I hope they do the movie up right. Maze runner? That's a VG genre?? If they're gunna make a movie about that, what's next, "The Side Scroll'er"? AMAZING. Okay, someone had to do it. looks like wes ball did the art himself. looks exactly like "Ruin"
Love Shailene, can't wait to see her in Gregg Araki's new film!